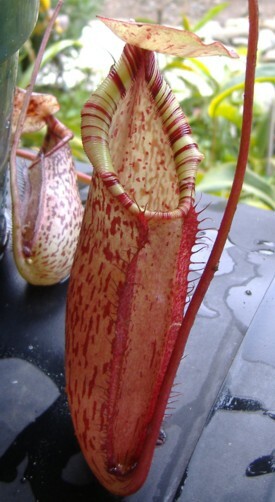 Nepenthes spectabilis X northiana is an Exotica Plants hybrid between a highlander and a lowlander. The lowlander being N. northiana and the highlander being N. spectabilis. Both parents produce excellent hybrids. 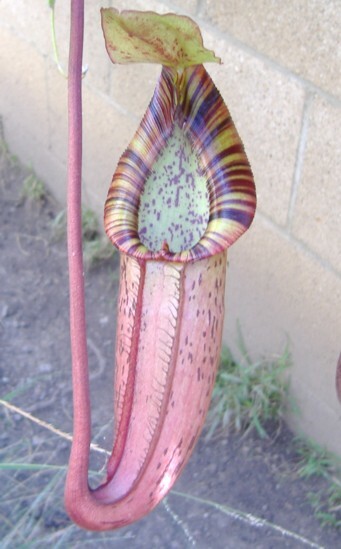 Exotica Plants puts out some great stuff with both parents especially N. spectabilis. Exotica lists it as an intermediate which makes sense since N. northiana is a lowlander. Even though N. spectabilis is a highlander, I've found that it can be grown warmer than other highlanders as it generally doesn't tolerate my winter temperatures as well as other highlanders. So far this particular clone has made it through my winters and is entering the vining stage and really settling in. Another hybrid N. ventricosa x ( spectabilis X northiana) grows fine for me as a highlander too proving that N. spectabilis X northiana can tolerate cooler temperatures than I expected.